We are a group of people that enjoy gaming, maily on X-BOX 360, but some (such as o2Rustyw02) also play PS3. Our main game is Forza Motorsport 2, other titles include COD 4, Halo 2 & 3, Burnout, C&C, and NASCAR 08. We are excited that you are visiting our web site. Our goals are to have fun. Other goals include hotlapping on FM2, running in tourney and ponin noobs. On this site you'll find information about our activities and members, along with achievments of our members. 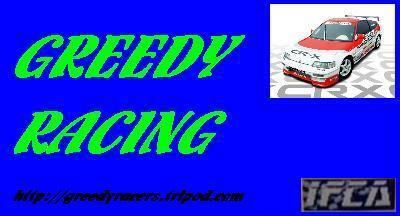 We hope you will find all of the information you are looking for about Greed Racing.